African Sigillata 1 Base 1 base with small-diameter ring foot from small to medium open vessel (bowl). 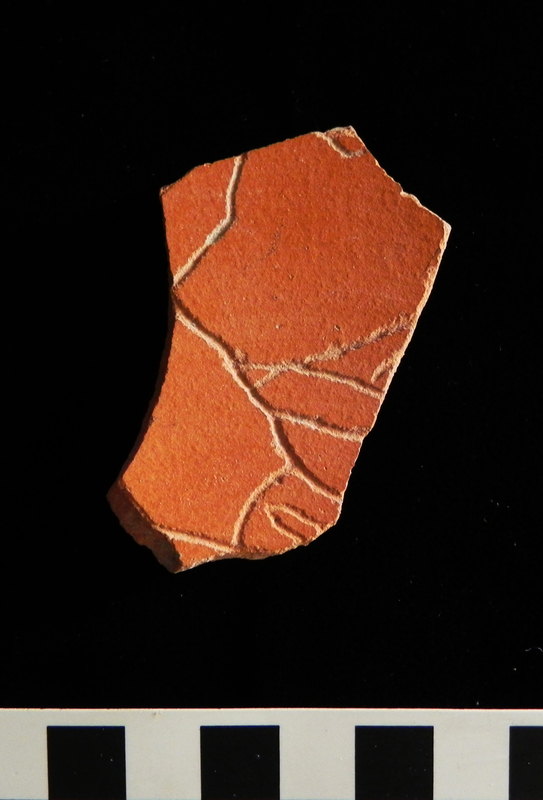 Fragment preserving portion of lower wall and outer portion of base. Probably from African Sigillata 1 Form 6 or 7. Fabric Variant 2. Red (10R 5/8) body with glossy light red/red (10R 5.5/6) slip on all preserved surfaces, pimply on exterior. Micromorphology: Exterior: Drag marks in area inside foot. 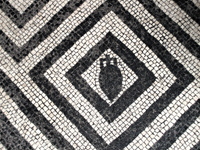 Complex incised drawing partially preserved on interior surface of floor; motif not clear. D. bs. 8; pr. ht. 2.3. Drag marks in area inside foot. Slip extensively chipped on resting surface ring foot.